If you are on the lookout to hire someone to assemble your IKEA furniture, then why not call the seasoned handymen from Simple Assembly? 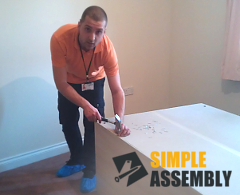 Our flat pack furniture assembly services in Tottenham N17 are designed to save you time and effort by transforming your fresh-delivered package into a beauty piece of furniture.We assemble a variety of different types of furniture, from storage system units, beds, tables and desks to office furniture and outdoor pieces for your garden. Our company works with all popular brands on the market, so the handy furniture fitters will have no problem at all to piece together your wardrobe according to the manufacturer’s instructions. Our assembly in Tottenham N17 services offer a number of addition benefits you will enjoy, when making a booking with us. For quick and easy booking on Tottenham N17 assembly services call 020 3404 5905 now! We have a team of friendly call centre operators expecting your call around the clock to help you define the right service for your needs and to offer you free quotes. And for those of you who'd rather get in touch and make bookings online, use our live chat or online booking form.